This is where the Niobrara River meets the Missouri and you have the newest-old town in Nebraska. You won't find the century old buildings so classic in towns building their main streets in the 1860s, for Niobrara has had to move its townsite two times after three floods left it at the bottom of the Missouri River. The history of Niobrara can trace its beginnings to 1856, when a group of men marked their claim on the banks of the Missouri River and built a log garrison. The company formed by Dr. Benneville Shelly was called "L'eau Qui Court." When Knox County was formed in 1877, Niobrara was named county seat; however, in 1902 the seat was moved to the town of Center. The Missouri River, responsible for the location of the original settlement, was also the reason for its first move. Spring thaws in 1881 produced record floods, followed by an ice gorge, which caused residents to seek the safety of still higher ground. Recognizing the ever-present danger near the river, people picked up and moved to a new town site a short distance to the west and south. 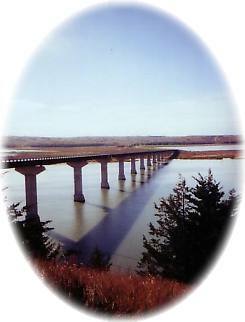 Niobrara's "port" continued to provide goods and services for a large area. Flood 2 - In April of 1952, while the Fort Randall dam in South Dakota was being built to prevent flooding, the town was again inundated. With the completion of that project, citizens rejoiced, assured that floods were finally "a thing of the past." Niobrara's centennial in June 1956 was a big event, with an estimated 20,000 people at the two-day celebration. Flood 3, Move 2 - By the 1960s, however, it became apparent that the river was not through influencing the town's history. Silt, previously washed downstream by the periodic floods, began to accumulate where the Niobrara enters the Missouri. As the ground water level raised, many basements required constant pumping. Three options were suggested to city officials by Army Corps engineers: abandon the town, build an elaborate dike and pumping system, or relocate to a new site. Citizens accepted the challenge to once again move their town. Site selection was completed in 1974 and lots were sold. Federal funds helped pay a portion of the cost of the move as well as provide for water, sewer, and paving. The move was nearly completed by the winter of 1977. The 1980 census showed 420 people and 213 homes in Niobrara's third location. In the years since the move, Niobrara's citizens have continued to strive for a solid, progressive community. Through volunteer efforts, a nine-hole, grass-green golf course was completed on the old town site. Niobrara's 125th anniversary was celebrated in 1981 with a parade, historical pageant, and other activities. Located less than two miles west, The Niobrara State Park, originally The Niobrara Island Park marked its grand opening in 1910. Later, many improvements were made by the Civilian Conservation Corps (CCC). The facility was operated by the village through the 1930s at which time it was given to the state, and continues under the Nebraska park system. It also suffered the same fate as the town and was relocated by the park commission and rededicated in 1987. The all-new park which overlooks the two rivers, offers scenic beauty, modern cabins, camping facilities, picnic and rest areas, horseback riding and an interpretive shelter telling of the area's history. Niobrara is the homeland of the Ponca people and the Northern Ponca Arts and Craft Shop keeps the Ponca culture alive through the skills of its members. Visit the museum for historical artifacts and get a real taste of the past in a covered wagon tour of the Kreycik Riverview Elk and Buffalo Ranch. Niobrara's history can best be summarized as being charted by the changes in the "Mighty Mo," on whose banks it was founded, and from whose reach it has continuously tried to escape. Bloomfield - Pospeshil Theater (1906): Elaborate pressed tin ceiling, fanciful woodwork. Gavins Point Dam, part of the 1944 Pick-Sloan Plan, plays an important role in the successful operation of the six main stem dams and reservoirs on the Upper Missouri River Basin. The dam was completed in 1957 at a cost of $51 million. The Sage Brothers Memorial plaque was originally placed at the entrance to Sage Brothers Memorial Field. In 1999 it was moved to downtown Niobrara, just north of the Niobrara Mall.